How to Prepare your Lawn and Landscape for Spring | Fairway Green Inc.
Spring is the time of year we think of warmer temperatures, longer days, plants budding and nice flowers. Before you start planning the outdoor barbecues and family get togethers, you may have some clean up to do after the winter weather took a toll on your landscape. Below are a few helpful tips on how to prepare your lawn for spring and spring landscape maintenance tips that will get your property ready before the outdoor parties and get togethers. The first step to prepare your lawn for spring is to assess the current status. Take a walk around your property to look for fallen branches, debris, and any damage that might have been done over the winter and recent storms. Create a prioritized list of items that need to be done to help stay on task and organized. After your property check, it’s a great time to assess your landscaping equipment to make sure everything is in working order. It will be difficult to prepare your lawn for spring if your equipment is not working properly. Check your lawn mower, leaf blower, weedwacker and anything else that has a small engine for leaks of any fluids or other obvious signs of damage. If you didn’t clean your equipment at the end of last year’s season, doing so now will make inspecting for damage a lot easier. Check the spark plugs on all your gas-powered equipment and change them as necessary. Once your inspections are done, it’s time to do some routine preventative maintenance. For your operating equipment, change the engine oil, grease bearings, inflate tires on equipment if applicable, and lubricate moving parts. Sharpen your mower blades before the season starts and on a quarterly basis going forward. It’s also a great time to spool your weedwhacker with some new line. When it comes to preparing your lawn for spring and spring landscape maintenance, cleaning is pretty much on everyone’s list! Clean out your landscape beds and the borders around the edges of the property from debris that collected over the winter. Prepare the lawn by raking leftover leaves and debris from the fall. This will also help if there are any winter lawn diseases present, such as pink or grey snow mold. By lightly fluffing up the matted down turf with a leaf rake, it will help increase oxygen flow and aid in growing out the disease. This type of disease will not cause any permanent damage and addressing it early is a great way to prepare your lawn for spring. The grass may still be brown despite the warmer temperatures. Don’t worry, the grass will green up. The thing to understand is that air temperatures do not green up a lawn; it’s the soil temperatures. As the spring days get longer, the sun has more time to warm up the soil. Once the soil reaches the ideal temperature for your type of grass, you will notice significant green up. 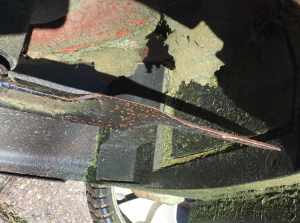 Dull and damaged mower blades like the one in this photo need to be sharpened to avoid shredding grass plants. The first mow of the lawn at the beginning of the year will set the tone for the season. Keep the grass at a height of 3 – 3 ½ inches in length all year long. Only take off 1/3 of the grass plant at a time. If you’re going through the steps to prepare your lawn for spring, don’t forget about your lawn mower blades! Keep your blades sharp to get a clean cut and avoid shredding the grass blade. A shredded grass blade not only makes the lawn look bad and gives it a whiteish tint, but it also weakens the plant, making it more susceptible to drought, disease and insect damage. Although September is the optimal time to seed your lawn, sometimes you just have to seed in the spring. Large areas that are bare, very thin, or have a lot of old, dead crabgrass plants in the area should be seeded. You can prepare your lawn for spring seeding by loosening the soil in those areas to about 1 – 1 ½ inches or add 1 – 1 ½ inches of top soil. Then, mix in your grass seed and lightly rake it into the loose soil. Grass seed germination rates are higher with better seed to soil contact. Now water, water, water! Watering is very important for new seed. Water every day for 20 minutes per area in the morning to keep your soil and seed moist. Seeding is the only time we recommend watering at high frequency and short duration. For tips on how to water your lawn correctly, please visit our blog. Keep in mind that any areas seeded in the spring will not be able to receive crabgrass or weed controls which in turn will make those areas have issues with weeds and crabgrass all year long. Have your irrigation company come by to check the system and turn it on for the season. Have any heads or pipes that were damaged from the cold repaired. Set your watering schedule to start out at one hour per zone twice per week. You want to get one inch of water on your lawn per week. As the temperatures get hotter, increase your watering time by half hour increments. Do not add more days, instead add more time to your watering schedule. Starting to water early in the season may sound crazy, but if you water early enough and get a good start, it will be healthy going into the harsh summer months and less susceptible to drought, disease and insects. So far, we’ve focused mainly on how to prepare your lawn for spring, but what about your landscape plants! 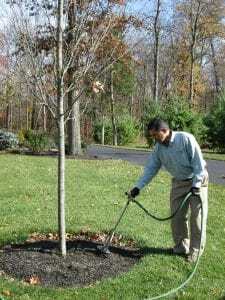 Now is the time to start spring landscape maintenance by pruning your trees and shrubs of any broken or dead branches. For flowering shrubs, wait until flowers bloom so you don’t cut off limbs that will be producing flowers or fruits. You should assess whether you can remove the branches yourself or if you should hire a company to do so. A general rule of thumb is if you have to get on a ladder to cut down limbs or branches, you probably should hire someone to do it. Depending on the nature of what needs to be removed, be sure to pick the right person for the job. Also, be sure that any tree company that you use is properly insured and licensed. Plant your annual flowers. This is a good time to spruce up your landscape with flowers. Flowers can really add a lot of ‘pop’ to an otherwise mundane landscape. Like shrubs, it is important to try and determine where to plant which flowers. For example, if there is a dry, sunny location that you want to bring color to, wave petunias may be an option. Or, if there is a lot of shade and moisture in a particular location, impatiens might work for you. Do you want to plant different flowers every year? If so, annual flowers are what you are looking for. Do you want to plant just once and have them come up in the same location every year? If yes, then perennials are the way to go. The choices of what flowers to use in your landscape is limitless. When purchasing new flowers or shrubs, be sure to read the tag to determine the proper planting location. For example, if you have an area that is mostly shaded, look for plants that prefer shade or minimal sun to give it the best chance of thriving in your landscape. Replacing dead or dying shrubs is another key step to preparing your landscape for the spring. If the shrub is dead, see if you can determine why it died. Is it the right plant for the location? Are the soil conditions ideal for the plant? 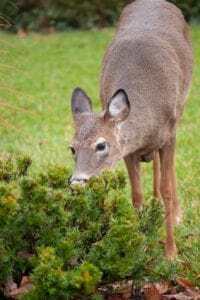 It is a good idea to determine these factors before replacing the dead shrubs with the same, or similar, plant. If it is deemed that the location is not ideal for the plant you want, you will be replacing that plant year after year. If you are unsure how to determine this, just give us a call and we will be happy to help you. Maintain 2 – 3 inches of fresh mulch on your landscape. This will help regulate the soil temperatures and help hold soil moisture for the trees and shrubs, reduce weed growth and give your landscape that nice clean maintained look. Please note that mulch should not be piled high on the trunk of trees or covering the shrubs. This will lead to decay and damage in the future. For more information on mulching and the risks of having too much mulch, please see our blog on mulching your landscape. When it comes to preparing your lawn for spring and starting your spring landscape maintenance, it seems like the to do list keeps on growing! That being said, there are perks to owning a home. It’s your sanctuary and taking pride in our properties adds benefits to our lives, communities and our environment. If you are in our service area and have any questions about topics covered in this blog, such as proper mowing, watering, seeding, etc. please don’t hesitate to call us at 908-281-7888.